A Guide to Borax and its Uses #infographic ~ Visualistan '+g+"
Borax is a material that has withstood the test of time. Once used in ancient times, it still proves its usefulness today. ereplacementparts has created an infographic entitled “A Guide to Borax and It’s Uses”, giving some history on this fantastic material, and offering some fantastic ways to incorporate its use into your home. Borax, a substance produced by the repeated evaporation of seasonal lakes, has been used from the time of ancient Greece to today. And while many people shy away from it, it is a non-toxic, effective cleaner, with tons of uses. 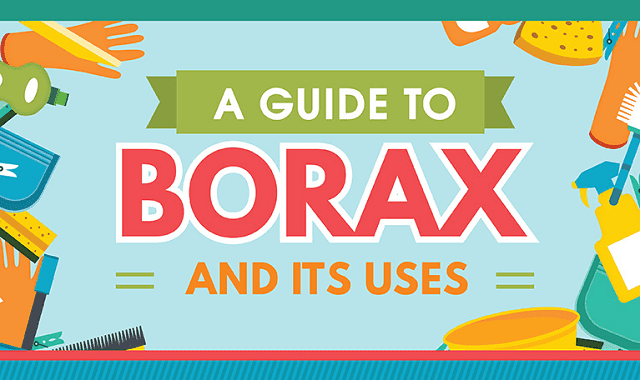 From making your own cleaners and dishwasher tabs, to staving off mold, rodents, and pests, this infographic has some fantastic ways to use Borax around your home. Feel free to like, comment, and share this infographic from ereplacementparts entitled “A Guide to Borax and Its Uses”.